Update, June 1: Agence France-Presse reports that the fire was extinguished early Wednesday morning. Ocean Princess, which pulled into Gibraltar this morning, anchored off-shore instead of docking. Passengers were taken ashore via tender. 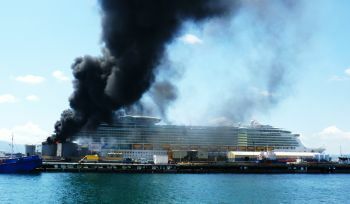 (2:10 p.m. EDT) -- A fuel tank exploded in the port of Gibraltar on Tuesday near Independence of the Seas, injuring 12 passengers. Royal Caribbean spokeswoman Cynthia Martinez said that the 12 injured passengers have received treatment onboard for minor burns, abrasions and a dislocated finger. 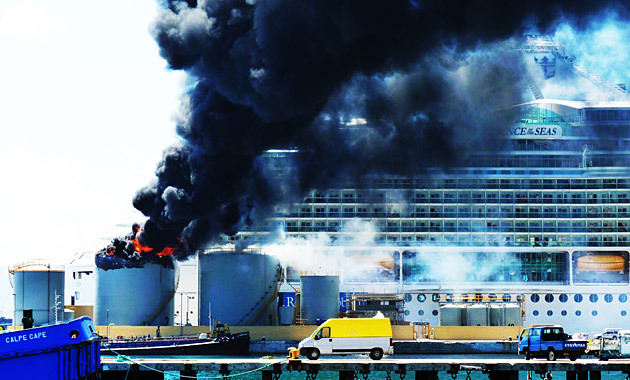 Two passengers were still ashore when the incident took place and were not injured during the explosion. Royal Caribbean is coordinating their travel to Cannes, France, the next scheduled port of call. The ship itself did not sustain any significant damage and is currently at sea. It's set to arrive in Cannes on Thursday. The Gibraltar Chronicle reported that there were also two injuries onshore, one of them serious. The AFP added that dense black smoke could be seen from the city center. Gabrielle Phillips, a Gibraltar resident who was at a playground with her son when the tank exploded, characterized the scene as "surreal." "At first there were gasps from the cruise ship passengers," she wrote in an e-mail to Cruise Critic. "But then they just watched on, very chilled out. My son didn't want to leave the playground, but there was a second container and I didn't want to be around for that explosion as well." --Photos appear courtesy of Gabrielle Phillips.